What’s the big deal about a chair? Well, actually, because this chair is big, about four times as large as a normal chair, and a work of art that has taken on a life of its own. 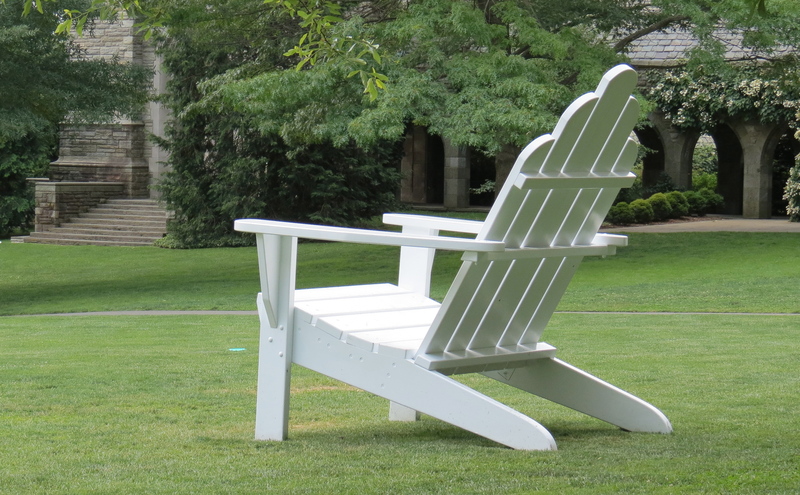 Jake Beckman, a student at Swarthmore College, conceived and built the original chair, which found a place among the other normal-sized Adirondack chairs that dot the stretch of lawn in front of the main hall on campus. The iconic chair even appeared on the Colbert Report. Several years ago the original chair fell apart and was quietly removed from the lawn. However, the campus community, becoming attached to the Big Chair, clamored to bring the chair back. Jake agreed to return to rebuild the structure, and the chair resumed its place with the others. I guess I wasn’t the only one beginning to think metaphorically about the Big Chair. Some unnamed inventives would come by during the night leaving the chairs in different arrangements, such as the Big Chair leading a line of the other chairs or the Big Chair in the middle of a circle. One morning the Big Chair stood upright while a semicircle of normal chairs tipped down in front of the Big Chair. Now I was thinking hard. The chairs assumed the metaphor for power dynamics . . . and not just at Swarthmore! I thought about “Big Chair” people, folks that tell us what to do or think: politicians, pundits, advertisers, bosses, CEOs, presidents, board of directors . . . and I’m sure you can think of a lot more. Do we perceive these folks as big in influence, power, authority, wealth and get drawn into a mindset that binds us to a deferential attitude? 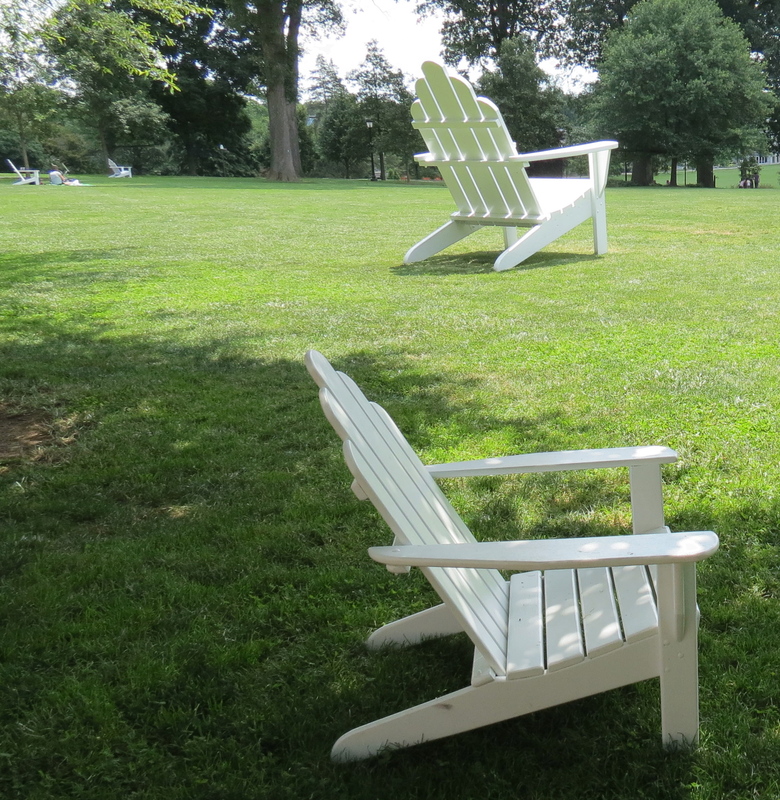 Many normal chairs sit on the lawn–there is strength in numbers when we act collectively. And normal-sized chairs serve a real function. We wouldn’t make 25 more Big Chairs. On reflection, perhaps we do need the Big Chair–reminding us to keep the right perspective. My name is Edith Ann, and I’m five years old……phppppppppppt. Cool post and artwork! Wonderful insight! Thanks sooo much for the follow!